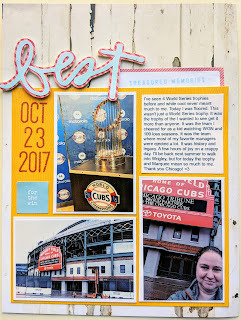 I couldn't wait to scrapbook this page. I went to Chicago and as soon as I got home my Best kit was waiting for me and I turned on my Sprocket and printed these photos from my phone. I wrote out my journaling on Instagram on the L back to the hotel from the stadium so I wouldn't forget how I felt in that moment. The background paper is October Afternoon B-Side from their Midway collection. I miss this company a lot. I put small white borders around the 2x3 photos and cut the white border off the pieces from the ticket book in the kit. I used my Elle's Studio date stamp set again and I use a roller stamp from my extensive collection.